Indonesian authorities refuse to allow the 44 Sri Lankans to leave a boat which has been stranded off the coast of Aceh for almost one week. 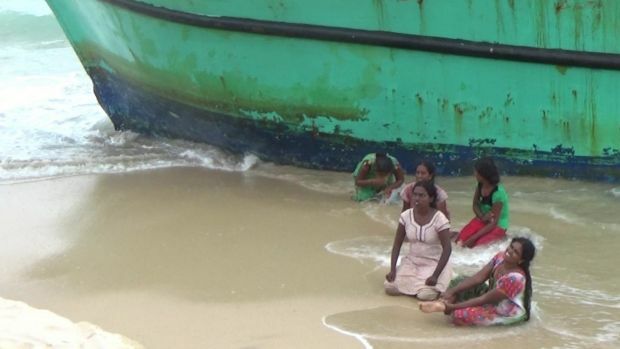 Jakarta: Police fired a warning shot into the air after a group of Sri Lankan women who have been stranded off the coast of Aceh since June 11 disembarked from their boat in defiance of orders from Indonesian authorities. Sabang navy commander Kiki said the boat was now fixed and would be escorted out of Indonesian waters by Indonesian navy ship Teluk Cirebon. “If they are from Jaffna, this would indicate they could be genuine asylum seekers who are fleeing a worrying deterioration in the security situation,” Ms Fan said. “Over the last few months there has reportedly been a military crackdown in Jaffna on former Tamil Tigers. Fairfax Media understands the women who jumped off the boat on Thursday sat on the beach and mimed shooting themselves in the temple. 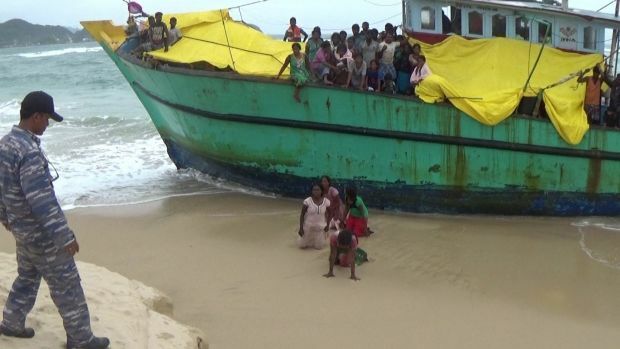 In chaotic scenes local police tried to cordon off the beach and persuade the remaining Sri Lankans to stay on the boat. Aceh Besar police chief Heru Suprihasto told Fairfax Media the warning shot was to “take control of the situation”. “The warning shot … was to control the local spectators who tried to come close to the boat and the Sri Lankans,” he said. The women, who suffered mild injuries jumping on shore, later returned to the boat where they – and the sick child – were treated by Indonesian health officers. Indonesian Defence Minister Ryamizard Ryacudu said it was important to co-ordinate with the country of origin of the boat people, although he said Indonesia was yet to discuss the issue with Sri Lanka. “If we do not solve it with the country of origin it will keep happening and happening. It can lead to criminality in this area,” Mr Ryamizard said. 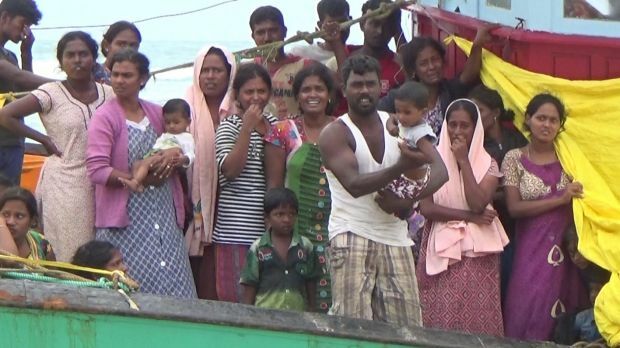 Amnesty International said the boat began a hazardous journey from India after those on board reportedly fled Sri Lanka. The human rights organisation said despite many recent improvements, there were still concerns about discriminatory practices against Tamils by Sri Lankan law enforcement officials. The International Organisation for Migration has indicated it is ready to assist with services if asked to do so. Indonesia is not a signatory to the UN refugee convention and refugees cannot legally work there while waiting for resettlement in a third country. There are 13 immigration detention centres in Indonesia, most of which are overcrowded. As of January there were 13,679 refugees and asylum seekers registered with the UNHCR in Indonesia, many of whom have been stuck in transit for years.